She thought her responsibilities ended at the courtroom walls. But how could they? He came to find her, wanting what everyone wanted, and what only free-thinking people, not the supernatural, could give. Meaning. The new coinage was half-truth and special pleading. Greedy husbands versus greedy wives, maneuvering like nations at the end of a war, grabbing from the ruins what spoils they could before the final withdrawal. Men concealing their funds in foreign accounts, women demanding a life of ease, forever. Mothers preventing children from seeing their fathers, despite court orders; fathers neglecting to support their children, despite court orders. Husbands hitting wives and children, wives lying and spiteful, one party of the other or both drunk, or drug-addled, or psychotic; and children again, forced to become carers of an inadequate parent, children genuinely abused, sexually, mentally, both . . . And beyond Fiona’s reach, in cases reserved for the criminal rather than the family courts, children tortured, starved or beaten to death, evil spirits thrashed out of them in animist rites, gruesome young stepfathers breaking toddlers’ bones while dim compliant mothers looked on, and drugs, drink, extreme household squalor, indifferent neighbors selectively deaf to the screaming and careless or hard-pressed social workers failing to intervene. In Bleak House Jo’s plight comes to represent that of all the children failed, not just by their parents, but by a state that proclaims its patriarchal authority but has abandoned its paternal responsibilities — more than that, the inability, or unwillingness, of anyone in power to save him is a symptom of a moral decay infecting the whole nation. “And dying thus around us every day,” charges the narrator, implicating his entire audience. England itself is the real “Bleak House” — and Esther, of course, is its symbolic housekeeper-savior. McEwan too shows us a world that is spectacularly failing its children, its dysfunctional families a sign of a society come unmoored. But from what? Not from religion, which features in several of Fiona’s cases as just another source of conflict, one powered by its own forms of irrationality. Against its destabilizing power is set the organizing intelligence of the law: Fiona’s work is to wrestle all the chaotic elements into order, to sort and weigh and evaluate and ultimately rule, with the “welfare” of the children her top priority — which, compared to Bleak House at least, seems like progress. his welfare is better served by his love of poetry, by his newly found passion for the violin, by the exercise of his lively intelligence and the expressions of a playful, affectionate nature, and by all of life and love that lie ahead of him. You were calm, you listened, you asked questions, you made some comments. That was the point. It’s this thing you have. It added up to something. You didn’t have to say it. A way of thinking and talking. . . . It wasn’t about God at all. That was just silly. It was like a grown-up had come into a room full of kids who are making each other miserable and said, Come on, stop all the nonsense, it’s teatime! You were the grown-up. Indeed she was, so why is this not the happy ending, for Adam and for the novel? I love being ‘young and foolish’ and if it wasn’t for you I’d be neither, I’d be dead! I wrote you lots of stupid letters and I think about you all the time and really want to see you and talk again. I daydream about us, impossible wonderful fantasies, like we go on a journey together around the world in a ship and we have cabins next door to each other and we walk up and down on the deck talking all day. how open and beautiful and terrifying the world must have seemed to him. . . . Adam came looking for her and she offered nothing in religion’s place, no protection, even though the Act was clear, her paramount consideration was his welfare. How many pages in how many judgments had she devoted to that term? Welfare, well-being, was social. No child is an island. She thought her responsibilities ended at the courtroom walls. But how could they? He came to find her, wanting what everyone wanted, and what only free-thinking people, not the supernatural, could give. Meaning. Is that the message behind Adam’s sad fate, that something needs to fill the gap left by religion’s absence? If so, why is it Fiona’s individual responsibility to provide it? Or is the failure a collective one — or is Fiona falling, at Adam’s naive prompting, into solipsism, imagining that somehow she (the “grown-up”) has all the answers, when the responsibility really lay with Adam to embrace his hard-won independence and make meaning for himself? 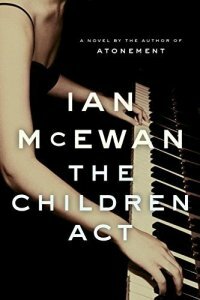 McEwan doesn’t make the novel the polemical knock-down case he surely could have against Jehovah’s Witnesses in particular or religious believers more generally; The Children Act is a less schematic novel, I think, than Saturday, in which the contest between artistic and scientific worldviews plays out in a clear, if not quite clearly resolved, counterpoint. But neither does he concede that religion is a particular force for good, or a particular good source of meaning. Does he mean to leave us agnostic? “Why replace one tooth fairy with another?” asks Adam, to which Fiona replies, “Perhaps everyone needs tooth fairies.” It’s a bit of a let-down, not to mention a rather big concession to the tooth fairy crowd, if the novel’s best idea is that everyone needs something to believe in. The notes strained at some clear human meaning, but they meant nothing at all. Just loveliness, purified. Or love in its vaguest, largest form, for all people, indiscriminately. Rohan, I just finished the book, and while looking for comments I found yours. Thanks, they are interesting and made me think. The book caused me deep impression. I think Adam gave Fiona “meaning” as well. She was mad at her husband because he wanted to have an affair with a young girl, and without looking for it she was caught in the same trap… that is the paradox McEwan is insinuating… she fell in love with a young, handsome, enchanting boy, in a beatifull way though: her heart was captured through poetry and music, … but she could never face it, like may people would never face an impossible love. And by not accepting the truth, whimsical fate, she failed in reaching her ultimate purpose in life: Adam hapiness and welfare! English is not my first language, so apologies for errors. Thank you so much for your comment, Matias. I like your point about Fiona also having “meaning.” I always admire McEwan so much for the degree of thought you can feel motivating his novels. Definitely Atonement. My admiration for it has grown the more time I’ve spent with it (including assigning it a few times in a literary survey class, where it is a great text to use to discuss Modernism). Thanks, I will read it then.